Autumn is an incredibly colourful time of year, which makes building autumn themed Lego creations incredibly satisfying. Using lots of colour in your Lego builds really makes them stand out by making them more appealing to the eye. I used plenty of rich, vibrant hues within this creation that really bring the build to life. The beach is created using layers of tan plates rounded corner plates, and then covered with dark red, and olive green leaf pieces as seaweed or fallen leaves. Protruding from the beach is a small dock leading out over the water. I used brown and medium dark flesh to create a textured, faded looking dock. 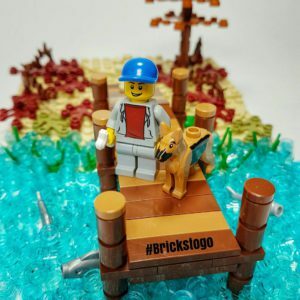 I like adding minifigs to my smaller MOCs to create a scene within the build. Here we can see a young man (we’ll call him Steve) and his dog out for a walk on what appears to be a cool autumn day. 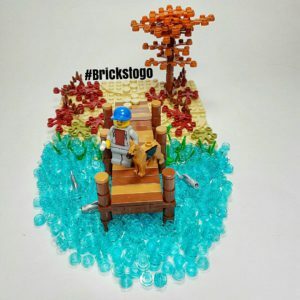 One of my favorite parts of the build is the water surrounding the dock, which is just created using 1×1 round trans-blue plates. I use a curved drawing ruler to create an outline before pouring the pieces into place. To add further detail to this small build, I placed a few fish swimming in the water, as well as some seaweed sticking out near the shore. The finishing touches are always the most fun because you can really be creative and use your imagination. Let me know what you think of this build, I personally really liked building this one, especially since it was out of my comfort zone when it comes to build styles. Trying something new can often lead to unexpected positive results!